MLS# 19437460 – 2800 Belden Dr, Los Angeles (city), CA 90068 – Robbyn Battles | Battles Real Estate | JohnHart "Real Estate Redefined"
Listing courtesy of Lauren Reichenberg (CalBRE #01415570), Compass. 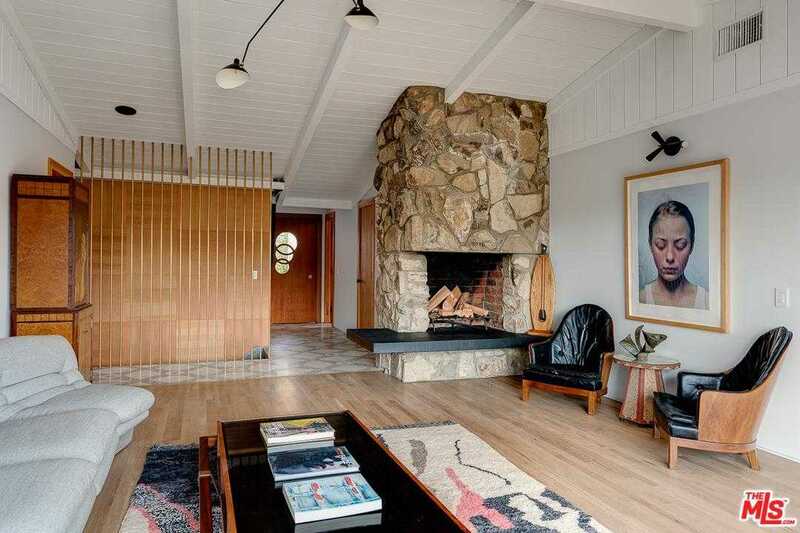 Beautifully restored/modernized Beachwood midcentury with exquisite finishes and sweeping views. Every surface and detail was curated with care to create a cohesive and unique home. Situated on a wide hill street, it feels like the only house on the block. This property consists of a 4 bed/3 bath main residence and a separate studio with dedicated entrance. Enter on a path of brass inlay terrazzo through a custom door to the top floor with soaring vaulted ceilings, great room, a guest bedroom, guest bath and master suite. The downstairs consists of a den, wet bar, two more guest bedrooms and a full bath. One more level down lies a spacious deck with 270 degree views. Other features include beautiful white oak floors, mahogany cabinetry, marble and stone surfaces, custom brass work, one of a kind light fixtures, Assorted fruit trees, an organic herb garden, two-car garage with direct access and huge windows to admire the canyon, city lights, Hollywood sign and Griffith Observatory. Building size: 2575 sq ft. Please, send me more information on this property: MLS# 19437460 – $2,380,000 – 2800 Belden Dr, Los Angeles (city), CA 90068. I would like to schedule a showing appointment for this property: MLS# 19437460 – $2,380,000 – 2800 Belden Dr, Los Angeles (city), CA 90068. Based on information from CARETS as of April 19, 2019 22:27. The information being provided by CARETS is for the visitor's personal, noncommercial use and may not be used for any purpose other than to identify prospective properties visitor may be interested in purchasing. The data contained herein is copyrighted by CARETS, CLAW, CRISNet MLS, i-Tech MLS and/or VCRDS and is protected by all applicable copyright laws. Any dissemination of this information is in violation of copyright laws and is strictly prohibited. Any property information referenced on this web site comes from the Internet Data Exchange (IDX) program of CARETS. This web site may reference real estate listing(s) held by a brokerage firm other than the broker and/or agent who owns this web site. The accuracy of all information, regardless of source, is deemed reliable but not guaranteed and should be personally verified through personal inspection by and/or with the appropriate professionals.